We have 15 varieties of apples in a walkable, grassy orchard. There is a nice big sign at the entrance that gives a great overview of the Orchard, which is helpful to find your favorite variety. 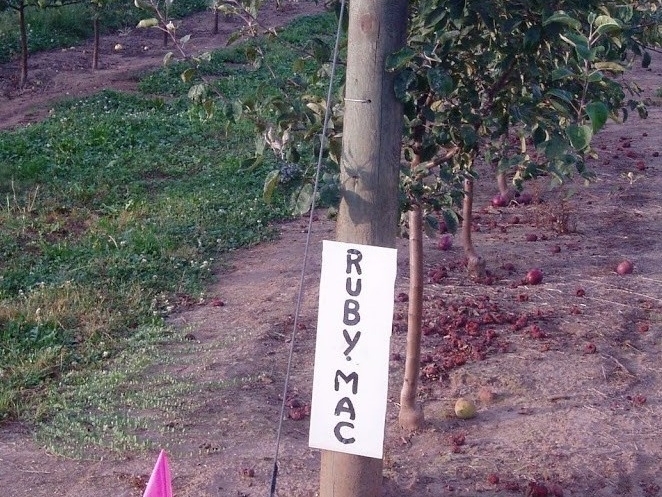 Each row is labeled with the name of the apple variety and will have additional signage alerting you to the ripe apple rows. We also have carts to haul your apple buckets around in and you can easily convince us into giving Gator (Side by side motorized cart) rides! If you want to know what varieties are ripe before you arrive, check the blog and/or sign up for the Orchard update e-mails. Additionally, during the listed hours, we will have staff on hand to help you find what you are looking for and answer any questions. Our trees are designed to remain shorter, so the apples remain in reach to all adults and within a stretch to all kids. There are no ladders needed or even available in our orchard. We also take extra care to trim the tops off of the trees each winter to ensure they don’t grow taller. Fresh, Local Apples Off the Tree with No Wax Coating and Extra Crunchy! Our apples are ready for you to pick fresh off the tree, you can't get more local. We have 15 fresh varieties that are ready between late August and mid-November. Your family can visit Beilke Family Farm multiple times during the late summer and fall to enjoy the orchard and pick many varieties of apples. Come visit us! We look forward to seeing you!